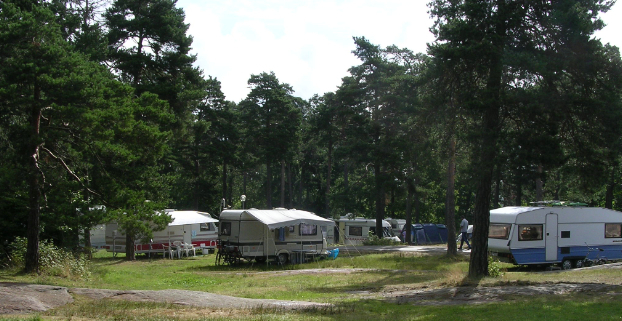 Trollhättans Camping Hjulkvarnelund, a city campsite in a forest setting, set in a quiet location with leafy surroundings, yet right in the middle of town. A short walk to shops and restaurants. You can walk along the river almost all the way from the camping site to the locks. On the way, it is worth stopping at the site of the Trollhättan falls. During the summer they pen the sluice gates and let the water rush out several times a week and along the river, there are several good views to be had of the fantastic falls and the town. You can watch the boats as they pass through the locks climbing or descending 32 m in the process and study the old lock-houses from 1800 and 1844. The Canal Museum will tell you more. From the falls, you can now go by cable car right over the Trollhätte Canal, with breathtaking views to Innovatum. Visit the Innovatum Centre where the inventors of yester year and contemporary innovators are presented side by side with Trollhättan's history. There is also a film centre and a large Internet and experiment department. A must for techno-freaks! In the same building you'll find the Saab Automobile Museum. In the town centre there is an art gallery, and adjoining the camping site is the pumping station, where art exhibitions are arranged during the summer. You can swim in Älvhögsborg Sports Centre's heated pools only a few hundred metres from the campsite. The Trollhättan Waterfall Days - a major summer festival - take place in July, one of Sweden's biggest family festivals.